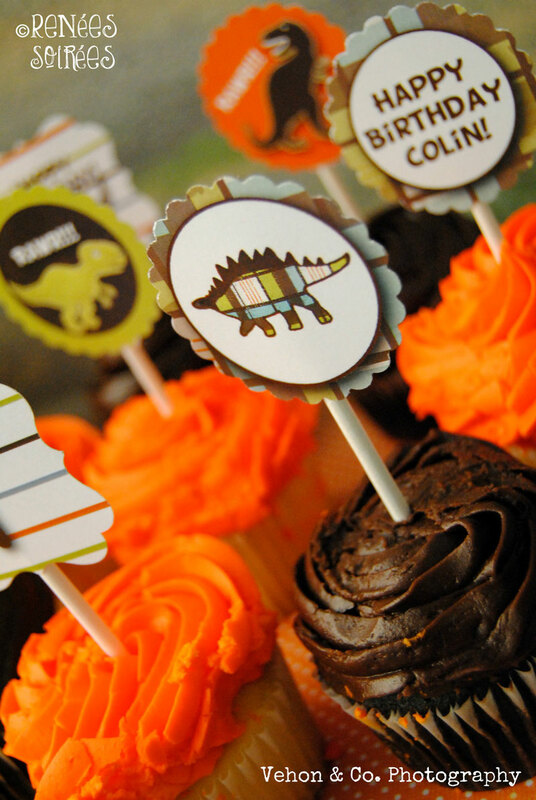 If you have a dinosaur lover in your life, then they will ROAR over this collection! 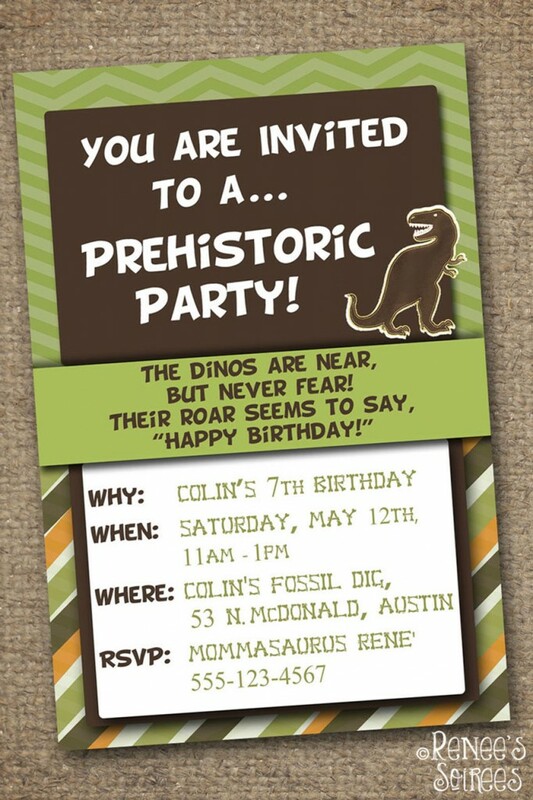 This was my son’s 7th birthday party, and his *second* dino party. 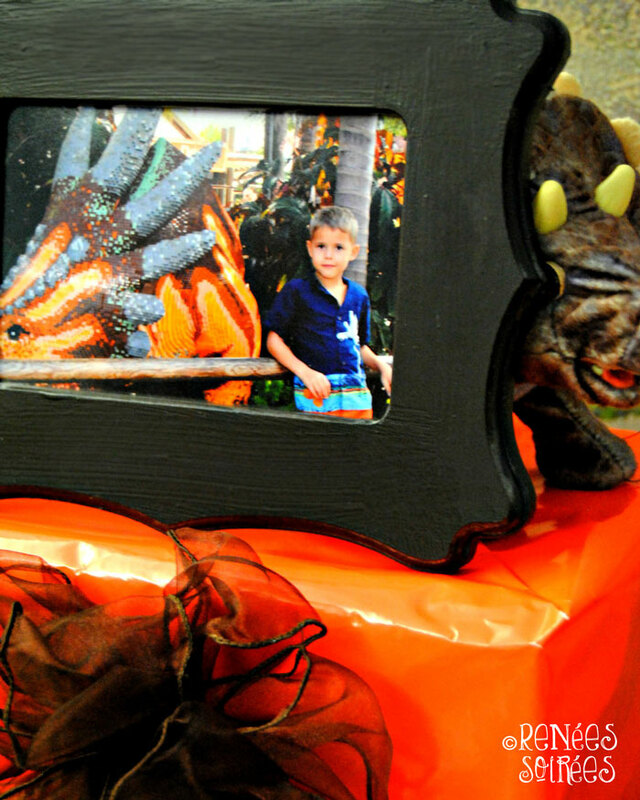 Normally I don’t repeat themes, but he loves dinosaurs That. Much. 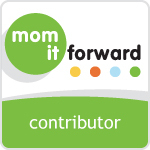 Of the 3 styles available, my son chose the plaid background because he liked the faint dinosaur images in the background (there’s no such thing as too many dinos for him)! 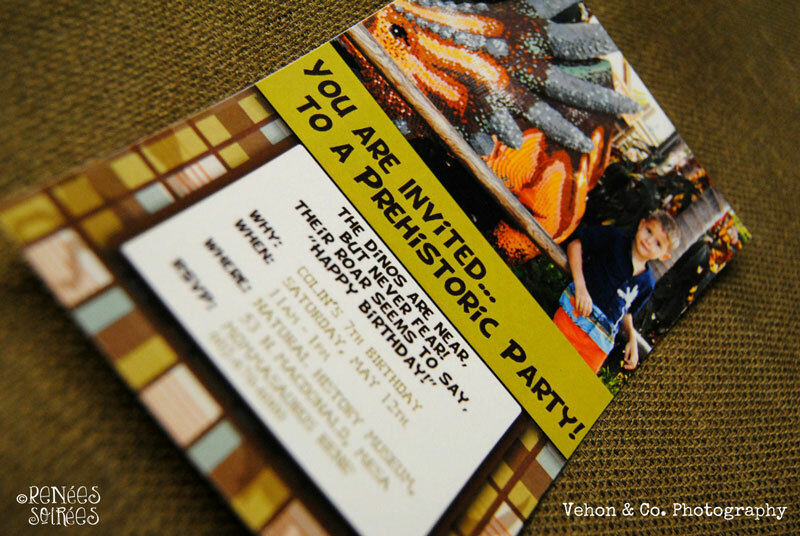 We started with the invite, available here… (The invitation is available in a photo version as well). 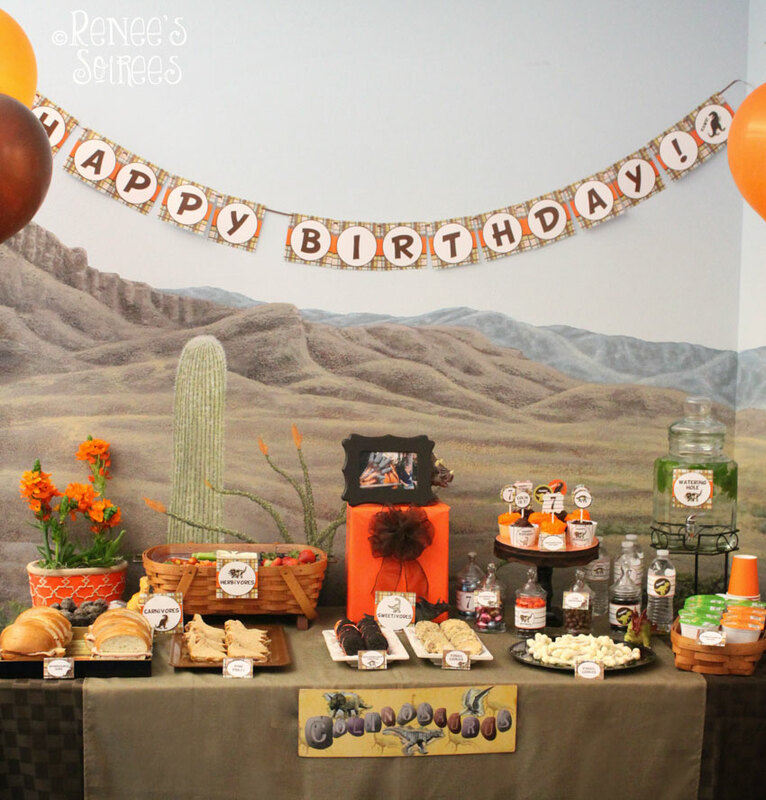 I used earth tones to create this collection… mostly brown, green, and orange. 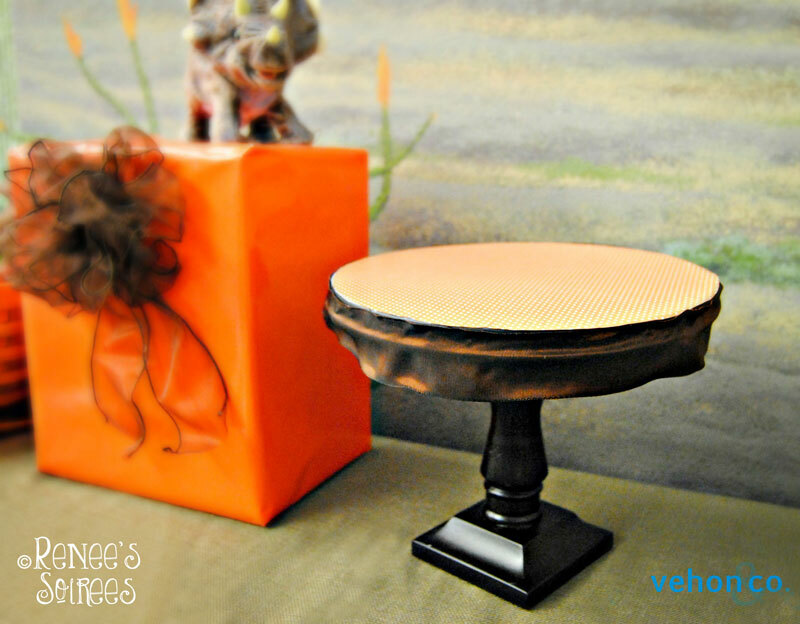 Because my son’s favorite color is orange and has been for many years, I highlighted that in the decor and printables (though I have versions of the printables where the brown or the green are more prominent as well). By the way, ‘Tangerine Tango’ is a version of orange that Pantone declared the 2012 Color of the Year. So stay tuned for future trend previews from Colin! LOL! 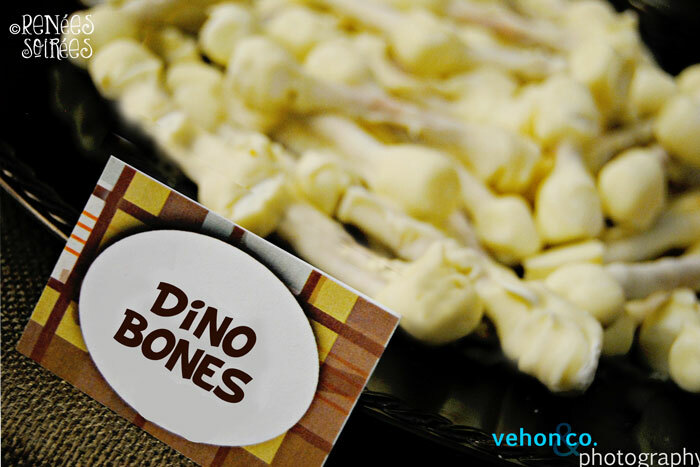 These ‘Dino Bones’ snacks were such a hit! 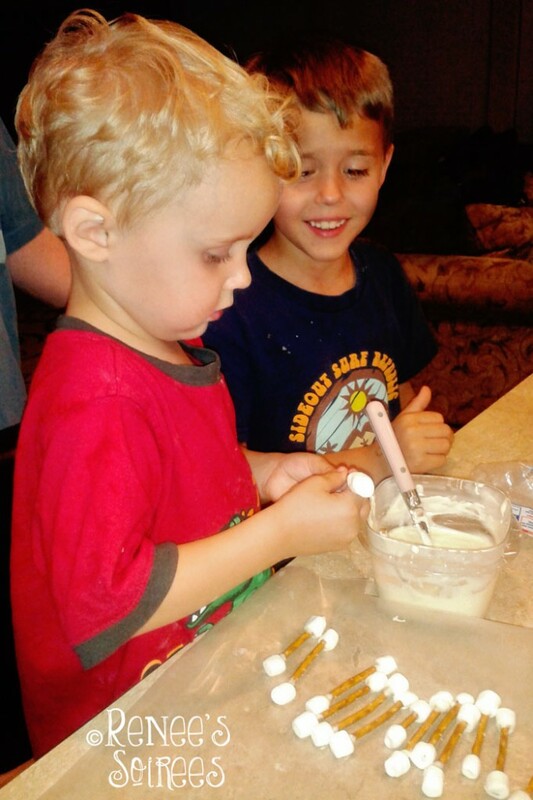 They weren’t too difficult to make, and all the kids got such a kick out of them. And in fact my 2-year-old helped make them. 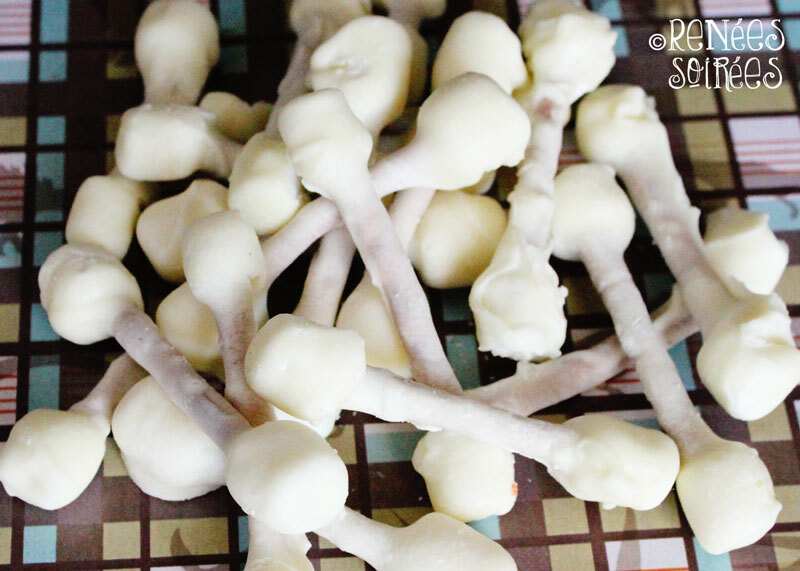 We just stuck mini marshmallows on the end of pretzel sticks, then dipped the whole thing in melted white chocolate (we used white Candy Melts, available at craft stores). 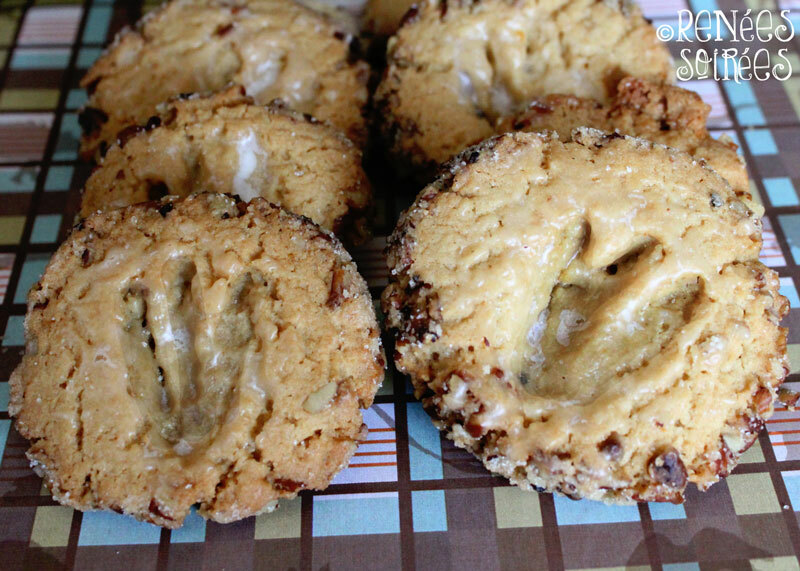 If you like salty + sweet snacks, you will love these! I also made the Fossil Cookies. Well, that’s what I call them, anyway. Basically I made a fantastic recipe called Nut-Edged Lemon Cookies; because they’re my sister’s all-time favorite cookie (recipe link in footer). Then I stamped one of my son’s dinosaur feet into them before baking (of course I scrubbed the T-Rex very well first, because a dino toy is certainly not a food-grade item). You could use a regular shortbread recipe instead, or any cookie that doesn’t change shape TOO much during cooking. I also ‘made’ some cookies that matched my color scheme. 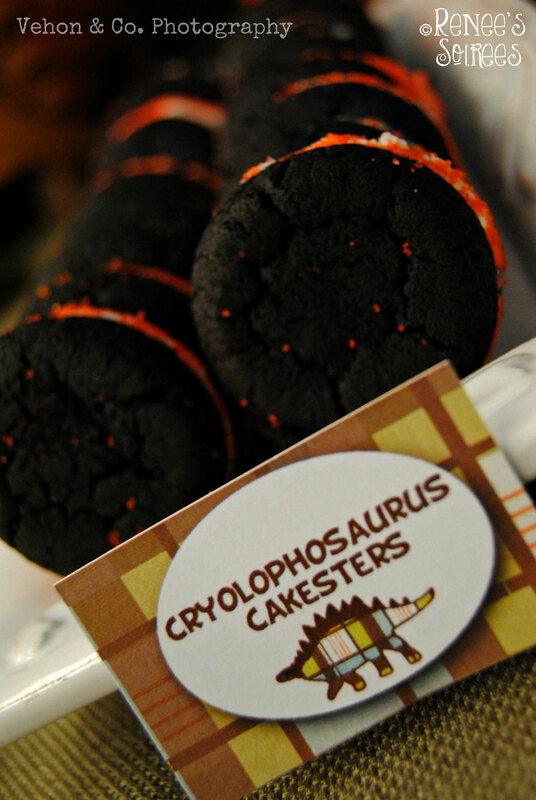 Actually they are just Oreo Cakesters, dipped in colored sugar. These cookies are great for party tables because you can get them in vanilla or chocolate, and roll them in whatever color of sugar or sprinkles you want, to make them match your theme. Super easy! It wasn’t all sweets, though. 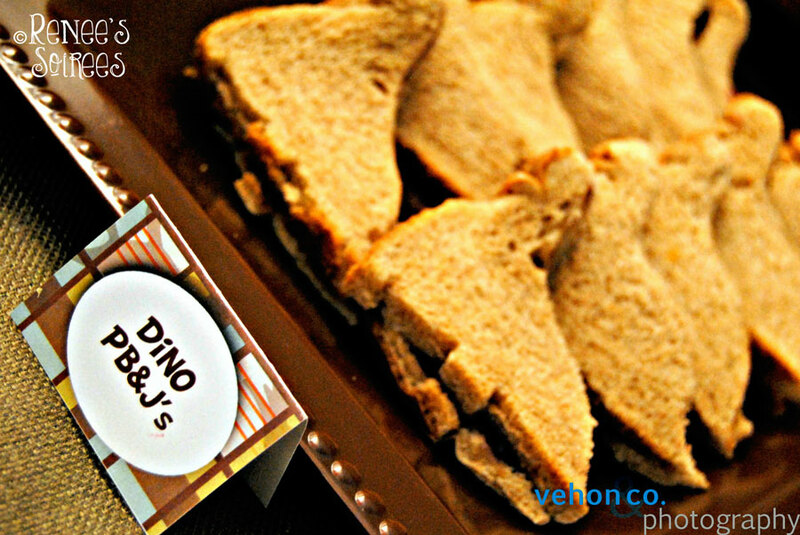 I made some PB&J sandwiches on bread that I cut out with a dinosaur-shaped cutter (I got mine at my regular grocery store). And I set out some Take & Toss cups, hoping to proactively avoid spills. 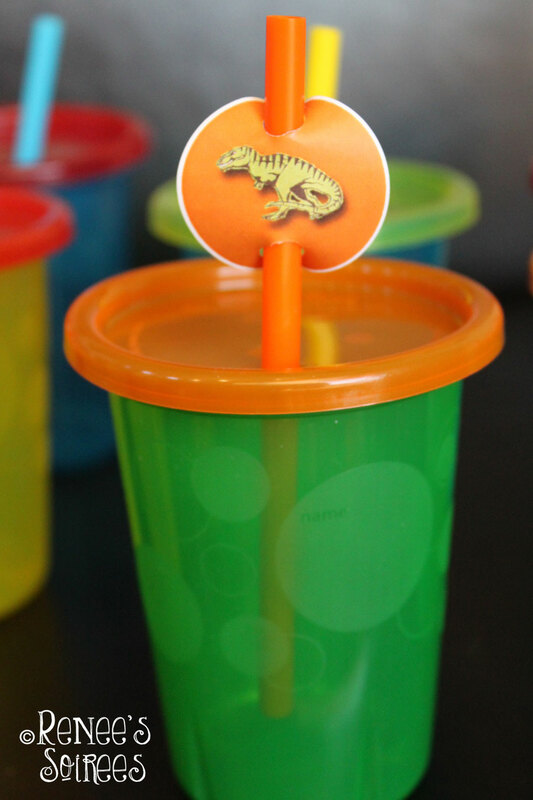 I added some dino flair to them so the big kids wouldn’t feel like they were using ‘sippy cups’. And of course, the requisite cupcakes in party colors, with custom toppers! 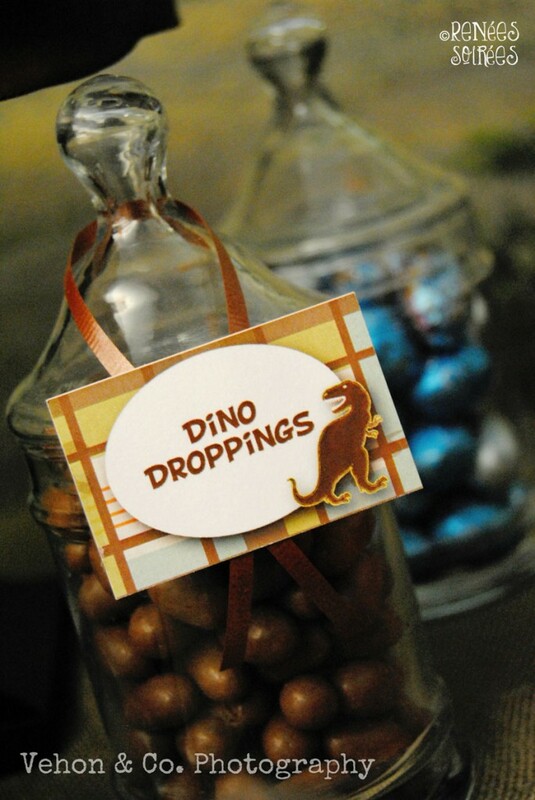 And finally, the FAVORS! I used bags from Dollar Tree (3 for $1), and bought the bottles of bubbles there, too (same price). 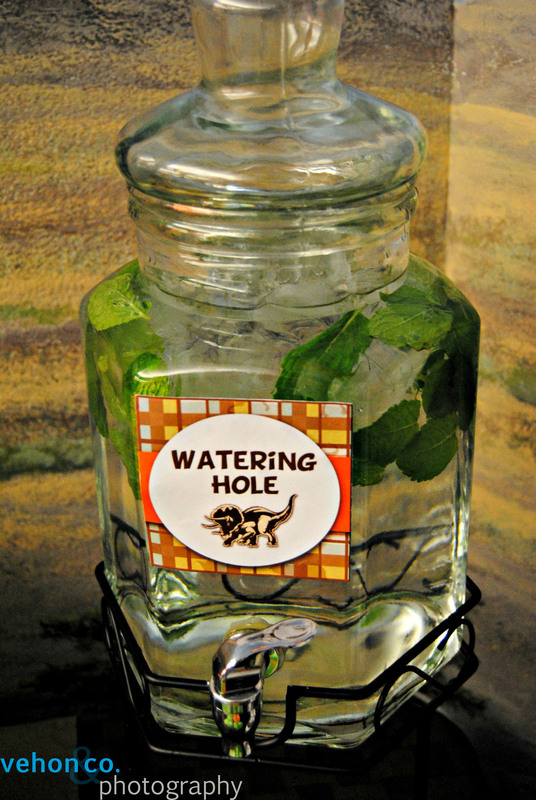 The bubble bottle labels are included in my Dinosaur Collection, by the way. 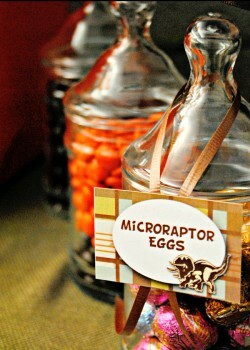 Inside the egg was a small dinosaur figurine, a bit of candy, and a dino tattoo. 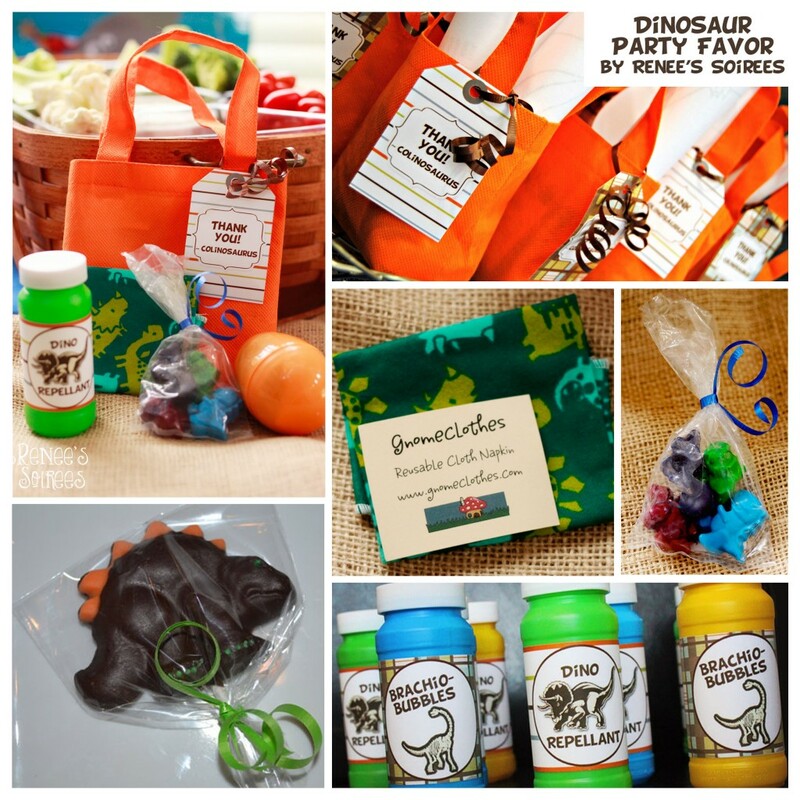 Plus some handmade items from some AMAZING Etsy sellers… a reusable dino napkin, some dinosaur-shaped crayons, and a chocolate dino lollipop! The museum also gave us some dino-themed word find puzzles and coloring pages, so we put photocopies of those into the favor bags. A party at the natural history museum also includes access to their exhibits and tours after the party, so it was double the fun for both the kids and their parents. Especially because my 2 1/2 year old kept arguing with the docent about her dinosaur facts. “Actuwee, it’s like this…” LOL! 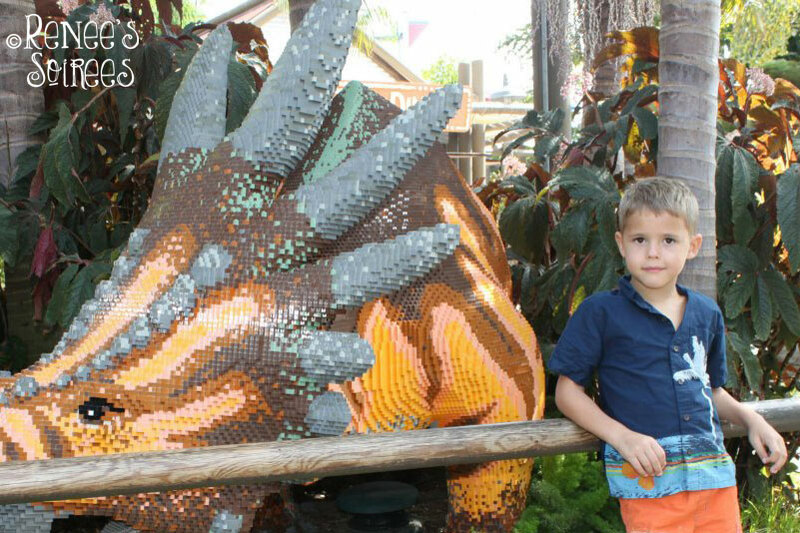 Told you I have two little dinosaur fanatics! 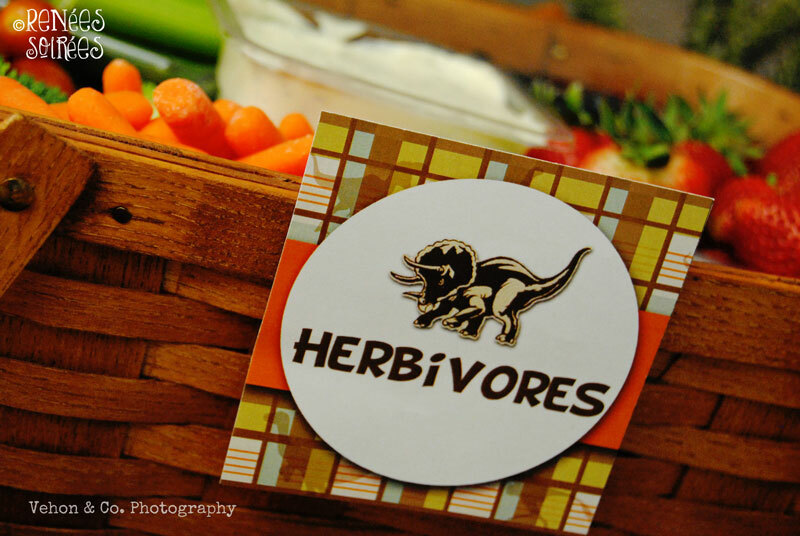 I hope you enjoyed our prehistoric party as much as we did! 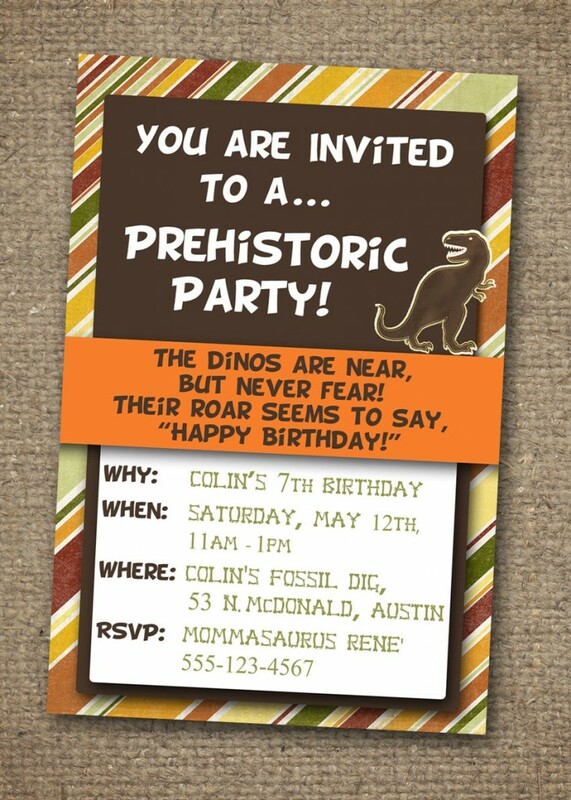 Happy Birthday, sweet Colin! 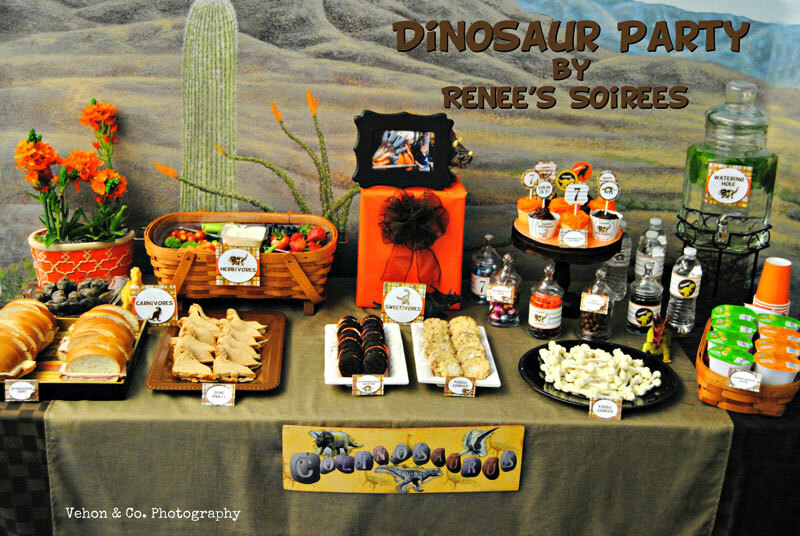 I had SO much fun creating a dinosaur party for you, and I know you’ll remember it for a looong while (because you talk about it all the time)!